The ‘XRP army’ will be celebrating today as the #3 cryptocurrency decouples away from the largely red market this morning and secures a 14% gain against the US dollar. 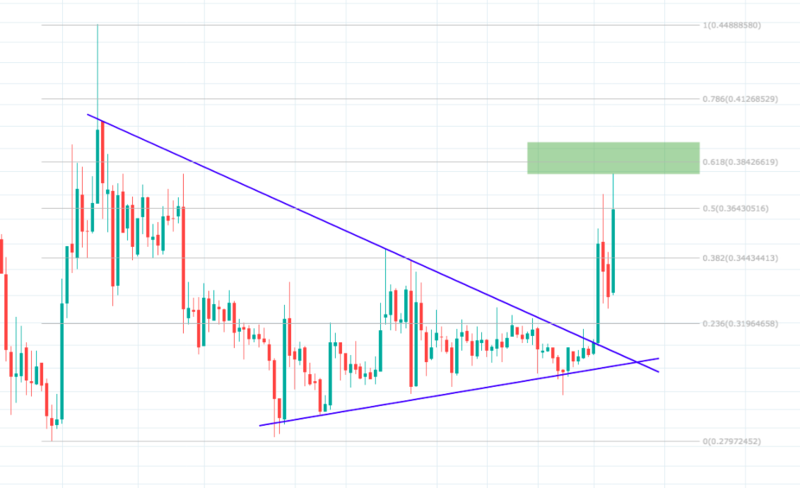 The breakout occurred at 04:00 (UTC+1) during the Asian trading session, which lifted XRP from $0.33 to a peak of $0.37. XRP trading volume in the last 24hrs has swelled by $1 Billion with a majority of XRP trades being executed against Tether (USDT). Right now the asset has corrected beneath the 0.5 fibonacci retracement level at $0.36, after failing to break over the 200 SMA resistance. Will the European and US trading sessions be able to provide a second surge of bullish momentum, and help drive XRP towards a new 3-month high? Let’s take a look. 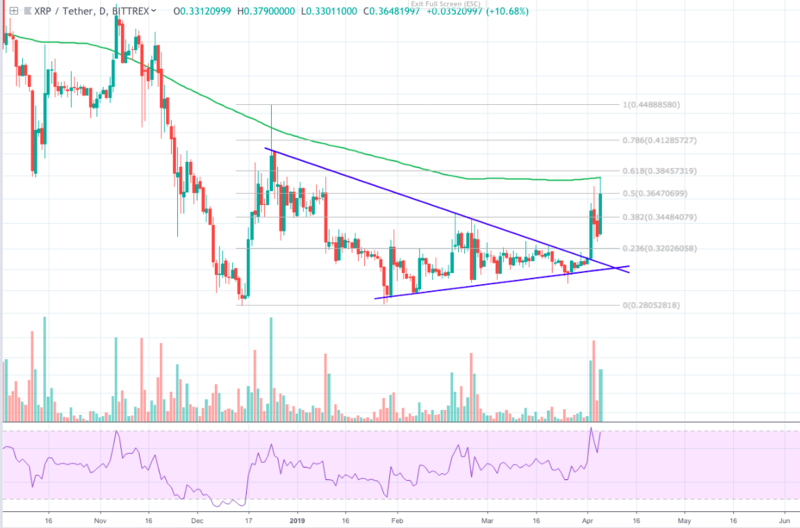 On the 1D XRP/USD chart we can see that the asset recently broke bullish from a pennant pattern on April 2, after reaching maximum consolidation. XRP managed to surpass the 0.382 fibonacci retracement level at $0.34 during the first impulse movement, but was unable to find enough support to break above the psychological $0.36 price point. From there, bearish traders put a swift end to Ripple’s opening bull run and caused the asset to correct by 12% down on to the $0.33 level. Right now, we can see that XRP is struggling to retrace back to the 0.5 fibonacci level at $0.364, after strong bearish resistance at the 200 SMA this morning forced bullish traders to retreat. RSI is still maintaining an upward trend towards the overbought region at 70%. The Aroon Up line has bullishly converged above the Aroon Down line. Parabolic SAR dots are beneath the price action. The 12MA is still high above the 26MA on the MACD indicator. From this it appears likely that XRP could return on to the 0.5 fib support soon, and potentially go on to retest the 200 SMA above if volume continues to grow.